Today Dwayne Steinle will take the last shot on Kodachrome, a picture of all his employees standing in front of Dwayne's Photo in Parsons (Kansas) wearing shirts with the epitaph: "The best slide and movie film in history is now officially retired. Kodachrome: 1935-2010." Switzerland never built an empire, so the technology of cartography (D|F|I) was developed late compared to other nations. The innovator was general Guillaume-Henri Dufour (1787–1875), who in 1838 started up a topography office in Geneva. 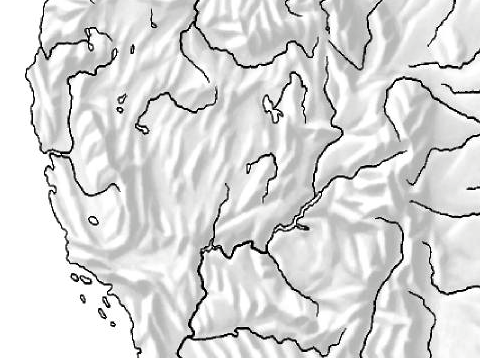 His main contributions were cross-hatching and shading, two graphical techniques important to render mountain terrain. 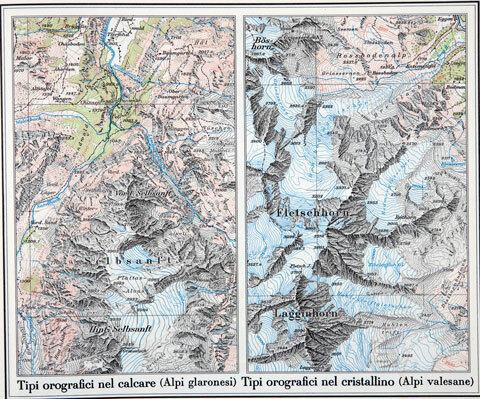 The Swiss topographic maps are of particular interest to color scientists and designers for their superior use of functional color. Another innovation of Swiss cartographers was the hierarchical ordering of labels. Labels have as an attribute the saliency of the feature they tag, e.g., the population, the level in the political hierarchy, etc. 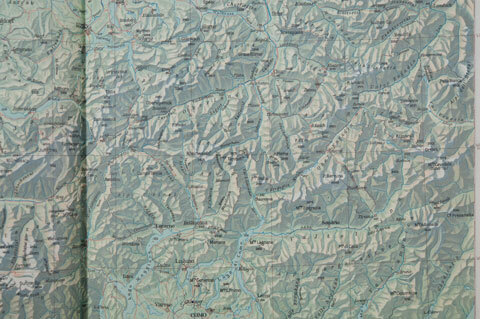 For each map, the labels would be printed only down to a level depending to the map's scale. The resulting maps are much less cluttered and easier to read. In fact, they are so easy to read that in their fifth school year, Swiss pupils buy a copy of the heavily Swiss Atlas for Middle Schools. Combined with the lessons in the classroom, this atlas explains the high rate of topographic and geographic literacy in the general population. 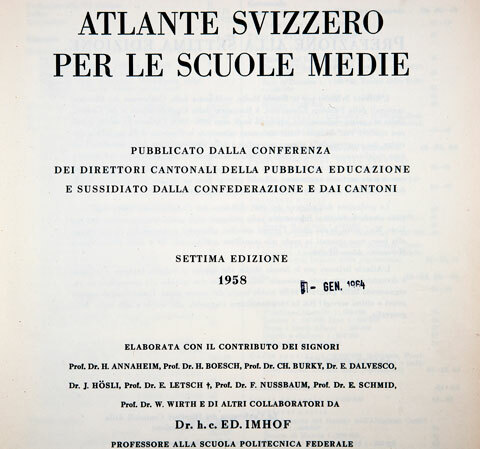 The first edition of the Swiss Atlas for Middle Schools was published in 1910. Therefore, the new edition published at the end of October 2010 is the Jubilee edition, and by the way, it is now called the Swiss World Atlas. For the Jubilee edition, the atlas has been augmented with another Swiss invention: the World Wide Web. The interactive world atlas (D|F|I|E) is continuously updated with the latest statistical data, as today's pupils demand (only the German version is fully operational at this time, the translations being on their way). In the download section, you can find the blank master copy maps used to teach geography in the Swiss schools. Can you label the map below? Hint: start from Lake Tahoe. If you have a recent computer, you can also start a Java application that lets you display a set of maps which synchronize automatically when you pan in one of them. Finally, there is a 3-d representation of terrain over which you can fly. Future nanoelectronics engineers might be capable of using individual molecules to perform the functions in an electronic circuit that are performed by semiconductor devices today. A joint research team from Basel University and the Karlsruhe Institute of Technology in Germany has now demonstrated that rigidly wired molecules can emit light under voltage bias. This result is important for fundamental science but it also adds to the molecular electronics vision an optoelectronic component, i.e. the development of optoelectronic components on the basis of single molecules. The team synthesized a specifically designed rod-like molecule with a fluorescent core and electrodes of carbon nanotubes. These findings are reported in Nature Nanotechnology. 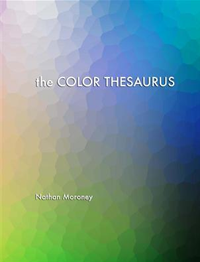 which color synonym should I use? From today, there is a tool to answer this question. In the old days of color science, in psychophysics we dealt with about 15 subjects (logarithmically: 1). 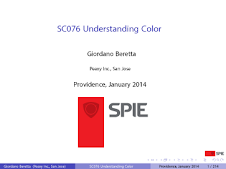 Then with the multilingual color naming experiment, HP Labs ratched this up to thousands (logarithmically: 3). Today, Google Labs is taking this to the next level: millions (logarithmically: 6), or 5,195,769 observers if you need an exact number. 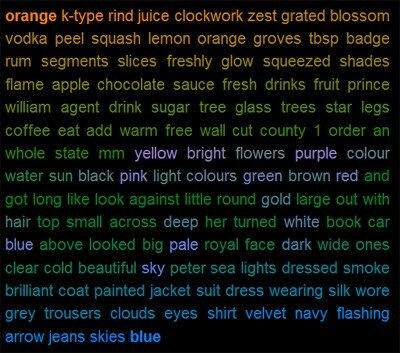 When the color naming experiment allowed you to find color names and their synonyms, the new corpus allows you to decide which synonyms to use. Let us get back to magenta and fuchsia. You are at Silicon Valley cocktail party, want to talk about your daughter painting her room in hot lips color, but do not want to come across as a geek. Should you call it magenta or fuchsia? First learn our latest tag: culturomics. While our technological advantage was crowd-sourcing, the next level is culturomics, where instead of harvesting an audience, all books are interrogated. Moreover, while crowd-sourcing was ephemeral, culturomics introduces time as a new parameter. The details are in the upcoming Science magazine paper Quantitative Analysis of Culture Using Millions of Digitized Books, by Jean-Baptiste Michel1, Yuan Kui Shen, Aviva P. Aiden, Adrian Veres, Matthew K. Gray, The Google Books Team, Joseph P. Pickett, Dale Hoiberg, Dan Clancy, Peter Norvig, Jon Orwant, Steven Pinker, Martin A. Nowak and Erez Lieberman Aiden. Essentially, Google Labs today is making 5,195,769 of the 15 million books they have digitized available for research. To put the number in perspective, these are about 4% of all books ever published. In harmony with what we wrote, fuchsia has been around since 1730, while magenta emerged 1851 with the battle in Magenta. While the first use in books was probably regarding Magenta, uses after London's 1860 red magenta definitively refer to the color. The above graph teaches us, that when talking to non-scientists we should use magenta rather than fuchsia, even when the former is currently dipping. This is good. After all, the color naming experiment teaches us that nobody knows how to spell fuchsia anyway. The corpus queried was English books, specifically, Italian books were excluded. Although the Latin spelling aqua has always dominated, up to 1870 the Italian spelling acqua was sometimes used. At the cocktail party, however, you should call it turquoise. Although this is a quantum leap, it does not yet solve the hot lips problem, because there is not enough data to isolate the context of color. For that we will have to progress beyond books, but Google does not yet know how to structure its corpus, as we wrote a while back. Will it be Bing? Seasonal affective disorder (SAD) is a well-known phenomenon, one that disappears on bright days when the sunshine returns. Researchers at the University of Geneva have concluded a study that shows how the brain responds to blue light, a part of the light spectrum that is often in short supply in the winter, particularly in northern Europe. The research found that such ambient blue light, found in daylight, increased responses to the stimuli in the "voice area" of the brain and in the hippocampus, an area of the brain that is important for memory processes. The light also led to a tighter interaction between a part of the brain that regulates emotions and the hypothalamus, which responds to light to regulate biological rhythms. In this day and age when everything is dumbed down to a sound byte or an elevator pitch, the structure of organisms is distilled to the false conundrum of nature versus nurture. Alas, reality is much more complex. Although a cone in your retina has a matching DNA strand in its nucleus to the one in a cell in your armpit, the two cells are quite different. The first lesson we learn is that what counts are not just the genes themselves, but which ones are expressed. For example, the genes encoding the peak spectral sensitivity for the L (red) and M (green) cones do easily get transposed, with the effect that the peak sensitivity moves. 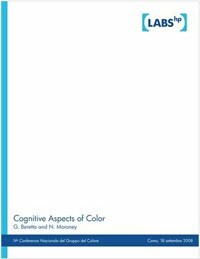 Yet, we cannot look at the DNA to determine if an observer has deficient color vision. What counts for the actual peak sensitivities are which genes are transcribed by the messenger RNA (mRNA). This can only be determined by looking a the actual opsin, there cannot be a genetic test for color deficiency because it is unethical to rip out somebody's retina. Fortunately, tests like the Ishihara Color Test and the Farnsworth-Munsell 100 Hue test do a good enough job that this is not an issue. Another insight is epigenetics (C. H. Waddington, 1942). Today, the study of the environmental influence on our genome is a hot topic. When we look at the brain, it appears that there is a skeleton that is present at birth. During the first period of life, the neurons grow and connect in response to stimuli, both real and virtual. This is for example why hospitals correct strabismus immediately after birth, because otherwise one eye never gets wired up to the visual system. An interesting question is whether there are constraints on how neuronal preferences can develop. This is a problem that Fred Wolf of the Max-Planck-Institute for Dynamics and Self-Organization, at the Göttingen University has studied. From the work of Hubel and Wiesel we know that in the visual cortex of carnivores and primates, neurons selective for the orientation of visual edges are organized in orientation columns, which are vertical arrays of neurons that prefer the same orientation. In the figure, the column at the left is the legend for the color encoding of orientations. As shown in the inset, orientation columns are arranged around numerous singularities, called pinwheel centers. The mean number of pinwheels per orientation-hypercolumn area is called pinwheel density. The self-organization of orientation columns dominated by long-range interactions would explain a common design. It can be shown mathematically, that for large interaction ranges, the mean pinwheel density predicted by the universal pinwheel statistics rapidly approaches an asymptotic constant equal to π.
Matthias Kaschube and his coworkers have performed a very rigorous experiment to measure the pinwheel statistics, which is described in a detailed 74 page paper Universality in the Evolution of Orientation Columns in the Visual Cortex. They have studied the visual cortex of the tree shrew (Tupaia belangeri), galago (Otolemur crassicaudatus), and ferret (Mustela putorius) and measured the pinwheel density. 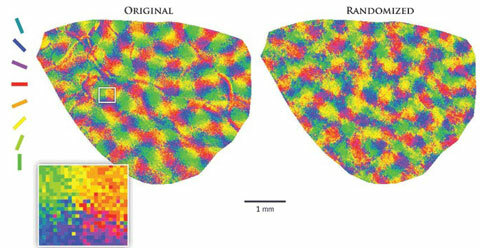 The map labeled "original" in the above figure shows the orientation map from a galago visual cortex. They also analyzed properties of orientation maps in ferrets reared in darkness beginning about 1 week before eye opening and the emergence of orientation maps, because dark-rearing alters the spatiotemporal pattern of activity in the afferent visual pathway, induces abnormal receptive field properties in the lateral geniculate nucleus and visual cortex, but does not prevent the formation of orientation maps. Finally, they have compared the pinwheel density with randomly generated orientation maps (right map in the figure) obtained by randomizing the phases of the original measurements in the Fourier domain and then subjecting the randomized maps to the same preprocessing and analyses as the original data. Only in the original maps the mean pinwheel density approaches an asymptotic constant equal to π. Their empirical results and theoretical analyses suggest that the precise spatial organization of pinwheels in the visual cortex reflects cortical network self-organization rather than genetic prespecification or environmental instruction of neuronal circuit development. Their theory reveals that dynamic network self-organization can robustly constrain the spatial organization of cortical circuitry to a specific design. Already in 1942, Waddington suggested that robustness of developmental processes may play an adaptive role in evolution, protecting developing organisms from both genetic and environmental perturbations by canalizing the physiological and anatomical organization of organisms into a much narrower range than might be expected from their genetic diversity. If Kaschube's explanation of the common design is correct, its evolution represents a genuine example of such canalization through an emergent property of complex cortical networks expressed in long-separated mammalian lineages. Kaschube et al. conclude that wherever such complex biological systems unfold, especially in the mammalian brain where they are likely to abound, the principles of dynamic network self-organization may design and constrain system behavior as powerfully as an organism's genetic endowment or early life experiences. We have known for 10 years about melanopsin-containing retinal ganglion cells (mRGCs). Research over the past decade has shown that they play an important role in reflexive responses to light, such as pupil constriction and regulation of the body's sleep-wake cycle. But they did not appear to be involved in vision. In July, researchers tagged the mRGCs with a blue protein to see where the cells occur in the mouse eye. When they tracked the cells' axons from the eye into the brain, they saw that many of them terminated in the lateral geniculate nucleus (LGN) and into parts of the mouse brain involved in conscious vision, not just the parts of the brain that control unconscious responses to light. Timothy Brown, a neuroscientist at the University of Manchester in the United Kingdom tested a range of light intensities, from starlight to bright daylight, in mice without rods nor cones and found that light as intense as daylight fired up the LGN. Brown and colleagues also looked at whether mRGCs might also send information to the LGN in mice with normal vision. "We found that approximately 40% of the brain cells that process visual signals appear to receive information from mRGCs," says Brown, whose team reports its work today in PLoS Biology. What the researchers don't yet know is whether mRGCs can sense variations in brightness across the visual field. The next step will be to do the complementary experiment, i.e., show that mice lacking melanopsin have inferior vision based on their behavior. Kyocera Mita Corp. has developed a color toner for multifunction printers that is made from resin gleaned from rice husks, palm kernel shells and other discarded plant materials and adds pigments to a resin base. For the new product, it developed a base that contains a 30% mixture of polyester resins derived from plant fibers. By making partial use of the plant-derived resin, the new color toner has a 30% smaller carbon footprint when the spent cartridges are incinerated. Rivals such as Ricoh Co. already sell mono-chrome toner made using such resins, but Kyocera Mita will be the first in the world to market a color toner product from the material. The SCOTS team at Glasgow University has posted a handy tool the BMC ComPair for visualizing collocates in the British National Corpus. Here's an example for orange and blue, also shown below. The instructions clearly state: "Collocates of both words are shown, together with your search words. The collocates near each extremity have a strong collocational strength with that search word, collocates in the middle are used equally with both your words." So vodka is more likely to be used with orange, while skies is more likely to be used with blue and light is roughly equally used by both orange and blue. Interestingly, the most common orange collocate is k-type, as in orange dwarf. The results for pink and beige are even more curious. But first let's try red and green. Over the years we had various posts on bit rot, the problem that digitally stored images become unaccessible after just a few years because the system that can decode them is no longer available. Essentially, this might be an ethical problem we cannot solve with technology. Recently, steganography has been proposed as a possible solution for digital image archiving, so today we revisit the origins of this approach. To avoid unnecessary excitement, lets us just reveal from the beginning that it cannot do anything about bit rot in image archives, because it requires a system to decode. Sure, you might interject we can always implement a decoder, but as we saw with PhotoCD, unless there is a commercial product in the form of an operating system feature, this statement is useless in practice. For example, we can read punched cards by simply scanning them, but I doubt that you would pursue this route if you still had a stack of cards in your basement. In the early days of digital color printing, the Feds were the early adopters of technology, so we always had their requirements in mind. One requirement relating to copiers and telecopiers (digital facsimile machines) was to be able to subject a document to seven copy generations without degrading its readability. At the time this lead to religious wars of colorimetric reproduction versus preferred color reproduction, with the idea that colorimetric systems stood a better chance in surviving seven generations, while preferred color reproduction (e.g., saturation boost and contrast enhancement) would make more money because most customers make just one generation and a better looking copy begets more business. The main digital color print technologies at the time comprised liquid and dry xerography, acoustic inkjet, thermal transfer, and dye diffusion thermal transfer (D2T2). In industrial research labs we cared mostly about dry xerography, because that is where the biggest profits were. At that time we were fighting with the triboelectric effect, so halftoning with dispersed dots like dithering, or error diffusion, did not work well and be had to use clustered dot halftoning. We were achieving the best results with Tom Holladay's rotated dots. They were ellipses at a 45º angle, which were robust for the triboelectric effect and prevented the human visual system from connecting the dots into unsightly patterns. Research is about synergies and serendipity, so at this point I need to digress. 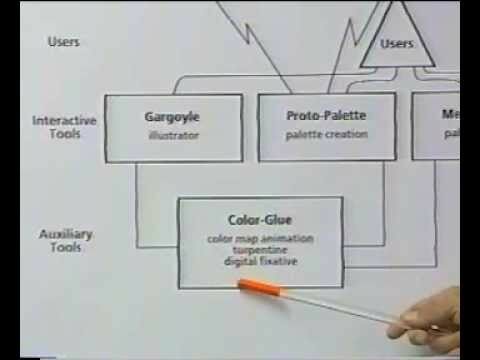 At that time (late 80s) PARC had a big cross-lab project called System 33. It played a big role in Xerox renaming itself the document company and had a big effect on society by introducing concepts like Mark Weiser's ubiquitous computing, document management, etc. The basic idea was to take all possible technologies currently in the research stage and connect them together in one big bet. One of these concepts was Smart Paper (not to be confused with the SmartPaper that then became Gyricon). Every document would have a cover page that could act as a banner page for print and a cover page for fax. This page would also have a barcode universally identifying the document. On one side this provided a solution for the copy generation problem, because a copier could reprint the original document referenced in the barcode instead of the document on the platen (annotation could be lifted from the paper document and overprinted onto the original document). On the other side, having a cover page on every document is ugly and a barcode is even uglier. Although all this is done by document delivery services, you do not want this on all your office documents. At this point the preceding two threads can be combined. Enter Rob Tow (click here for his account), who in 1988 came up with the idea of encoding information in images on documents (all office documents tend to have at least a company logo) by using Holladay's rotated dots for a binary code, by simply rotating them at ±45º. Rob called them glyphs. Encoding a document's universal identifier in the logo was just a simple application. A more compelling application was to encode the CIELAB values of an image's pixels in the image's halftones. A dumb copier would simply do whatever it did to copy an image, but a smart copier would decode the image's colorimetric information from the halftones by interpreting them as glyphs. At the time we coined the phrase "scan–think–print" for digital copying, so we could safely assume each one of our copiers would always have the additional intelligence to restore an image's colors from the glyphs. The actual image was then just a backup for the dumb copiers from the competition. We even filed an invention disclosure for an Oliver North copier, which was a DocuTech with a built-in shredder. It would scan each page, encrypt the bitmap, and print the result using glyphs. The original document would be shredded right then and there, as part of the process. The copy could be stored and distributed in plain sight. It could even be copied at least seven generations, but only when the operator inserted in the copier a token with the decryption key, the copy would be the original readable document. This would have solved North's problem because he would have had only his token to be destroyed. Rob got US Patent 5,315,098 on the basic concept, but then it took a lot of work to turn the idea into a robust technology. For one, the glyphs had to survive the infamous seven copy generations. Meg Withgott had come up with the concept of document dry-cleaning, but it took Dan Bloomberg substantial work in mathematical morphology to achieve a robust implementation for glyphs. Then there were the problems of optical distortions, self-clocking, and error correction, among many others. All said, until the technology was done David Hecht and Noah Flores got 51 more US patents solving all the details. The final artifact became a Xerox product under the trademark DataGlyphs. A project called Express (Henry Sang, Jr. was one of its leaders) achieved a successful commercial deployment solving the problem of processing the field test reports for Syntex, with others following. Bit rot refers to images meant for archival applications. In that sense the glyph technology was not invented for bit rot but for document management, i.e., with a limited time scope in mind. I am also using the term steganography in a loose sense, because it really refers to hiding a secret payload image into a carrier image. As such, steganography has to work only over a very restricted time span, just to smuggle an image through a hostile boundary. A related concept is that of watermarks. Here the system has to be available only for the duration of a copyright, and the owner has a pecuniary incentive to keep the system working during this time. As far as I know, currently the most promising remedy for bit rot is encoding the images in the DNG format and encapsulating them into a PDF file. However, this archiving path is not yet available at the operating system level. And there will always be the ethical issue to enable digital image archiving.